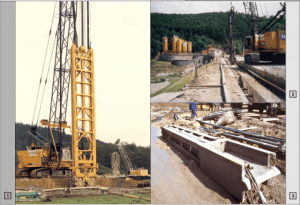 Diaphragm walls are concrete or reinforced concrete wallsconstructed in slurry-supported, open trenches below existingground. Concrete is placed using the Tremie installation method orby installing pre-cast concrete panels (known as a pre-castdiaphragm wall). 2: Excavation pit retained by tiedback diaphragm wall and partiallybraced by cast-in-place buildingfloor slab. 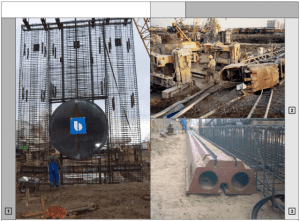 Diaphragm walls can be constructed to depths of100 meters and to widths of 0.45 to 1.50 meters.Diaphragm wall construction methods are relatively quiet and causelittle or no vibration. Therefore, they are especially suitable for civilengineering projects in densely-populated inner city areas.Due to their ability to keep deformation low and provide low waterpermeability, diaphragm walls are also used to retain excavation pits in the direct vicinity of existing structures. 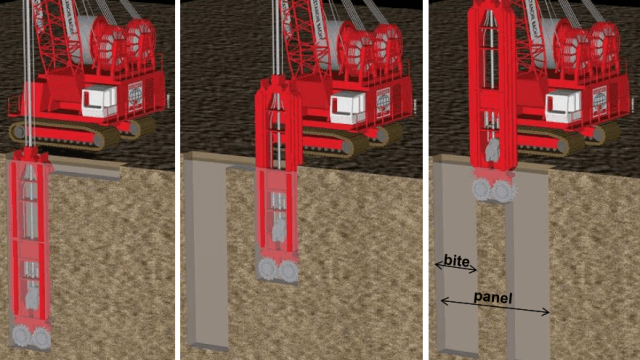 If there is a deep excavation pit at the edge of an existing structureand groundwater is present, diaphragm walls are often used as themost technically and economically favorable option. They can beused for temporary support or as load-bearing elements of the final building. 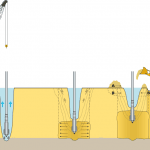 Diaphragm walls can be combined with any anchor and bracing system.Diaphragm wall panels are also used in deep, load-bearing soillayers as foundation elements to carry concentrated structural loadin the same way as large drilled piles do. These foundation elements are known as “Barrettes”. 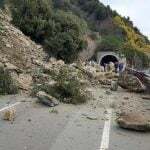 If diaphragm are socketed into impermeable soil layers of sufficientthickness or if they are combined with seal slabs (grout injection ortremie concrete slabs) almost waterproof excavation pits are created. 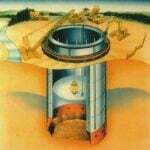 After reducing the initial groundwater level within theexcavation, only small amounts of residual water will penetrate. • Prior to diaphragm wall excavation, cast-in-place or pre-cast concrete guide walls are placed. These braced guide wallsstabilize the soil in the upper diaphragm level and provide a stableguide-way for the grab. In addition, they also support thediaphragm wall reinforcement and provide sufficient bearing forthe hydraulic jacking system to remove the Stop-End Pipes. Thespace between both guide walls serves as a storage space for thestabilizing fluid. • Lamella excavation Using hydraulic grabs with clam shell sizesof 2.8, 3.4 or 4.2 meters, single diaphragm panels can beexcavated down to tip elevation. To avoid collapsing ground,trixotropic stabilizing fluids (Bentonite slurry = clay/water slurry)are pumped into the excavated panel. Depending on groundcondition and geotechnical design, several single panels can becombined to one large lamella. Hard soil, rock or obstructions canbe removed using chisels in addition. • Stop End Pipe Installation. To separate the single concretingphases, stop-end pipes are installed at both panel fronts. Thesehave the same diameter as the panel’s wall thickness and areremoved after initial concrete setting. The remaining semicircularjoint provides a very good interlock between the individualconcrete panels. • Concrete Placing by Tremie Method. Simultaneously withplacing concrete, slurry is pumped from the panel to be refreshedand re-used in the next panel excavation. Since the slurry isreplaced by concrete, this method is called “Double-PhaseMethod”. • Removal of Stop -End Pipes after concrete setting usinghydraulic pipe extractors.Diaphragm Wall Joint Design• There are three (3) types of joint design used for diaphragm wallsconstructed by the grab excavation method• Steel stop-end pipes, which are removed before the concrete hasset completely (as mentioned before). Concrete seeped aroundthe stop-end pipes can be safely removed by the use of chisels. If diaphragm walls are constructed using the hydro-cuttertechnique, stop- end pipes do not need to be installed. After theprimary panel set sufficiently, the secondary panel excavation willslightly cut into the fresh concrete to ensure a tight overlap duringthe concrete placement. Double rope grabs as well as grabs guided by telescoping Kellybars are commonly used for excavation in soils. Hydro-cutters canbe employed for rock as well as soft soil excavations. They continuously cut into one panel by sucking the soil-bentonite slurryat the cutter head while replacing it with fresh bentonite at thepanel’s top. Two different construction techniques, the alternating method (orPilgrim) and the continuous method can be distinguished forexcavation. During the alternating method, only primary panels willbe placed leaving out the following secondary panels. Following thefirst primary panels, gaps will be closed by the adjacent secondarypanels. Primary and secondary panels will have different sizes dueto the use of stop end pipes.During the continuous excavation method (Endless Panel), all thepanels are excavated in one continuous process. Therefore they allhave the same size. • Sheet pile wallsare cut-off walls mostly without any load-bearing function. If slurry walls are intended to act as cut-off walls without any loadbearing function, a mixture of water, bentonite, cement and maybefiller can be used.This slurry remains in the excavated panel and hydrates. 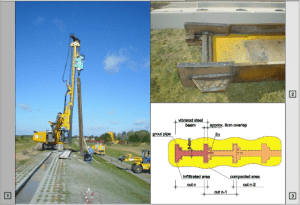 • Or by the use of slurry wall grabs or hydro-cutters Using the single-phase technique, panel depth is limited due to therelatively short time from placing and setting of the suspension.In deeper panels, the Two-Phase technique is used to construct aslurry wall. Construction is similar to the cast in-situ diaphragm wallinstallation. After completion of the panel’s excavation, the actualsealant slurry will replace the stabilizing bentonite fluid. This sealanthas to be placed using the slurry-displacement or tremie methodand needs to have a 0.75 to/m³ higher unit weight than the bentonite slurry to replace it.To improve permeability and contaminant resistance, combinationcut-off walls can be installed using the Single-Phase system. Sheetpiles or plastic liner sheets can be installed within abentonite-cement-slurry wall. 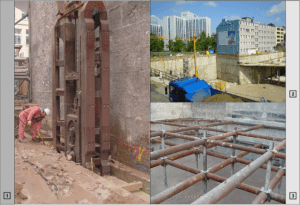 Cut-off walls with embedded sheet piles or structural beams beingconstructed using the single phase method can also be used as”water- tight” excavation pits.In the process the sheet piles or beams act as load transferringelements and will extend to required depth below the excavation pit. 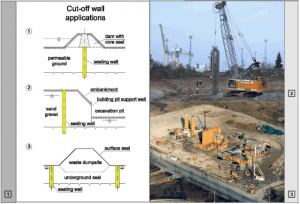 Thin slurry walls also can act as vertical cut-off walls to retainhorizontal groundwater flow.In contrast to cut-off walls constructed using the diaphragm walltechnique (replacing the soil by slurry sealant), thin slurry wallsdisplace the soils using a vibrated steel profile. During the extraction process, sealants are injected into the created cavities.Drivable soils, such as sands and gravels, are required for thisinstallation method. The created slurry wall thickness depends onthe shape of the steel profile used and the soil conditions. Thickness varies between 5 cm in sands and 20 cm in gravel. 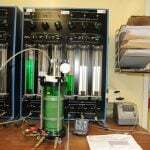 Incombination with high-pressure jet grouting, wall thickness of up to30 cm can be achieved.A continuous wall is created by overlapping single penetrationelements installed one after another by the vibrated steel profile. A guide plate attached at the beam`s flange is running down thealready completed web of the previous panel. This ensures thecorrect overlap to the previous panel. 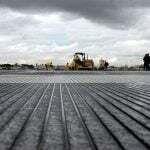 What type of pavement is used for airports runway? What are stone columns ?